The right diamond ring should be a timeless reflection of your love, your commitment, and your personality, which can sometimes make choosing the right diamond ring a difficult choice. What is important to you in your ring will depend on your own personal style, fortunately, there are many cuts of diamond rings available. 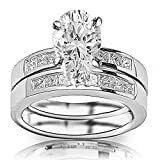 Here, we will review the 10 best cuts of diamond rings to help you choose the ring that best reflects you who you are, while also looking good on your finger. 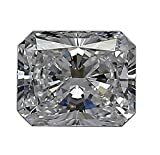 What Are the Best Cuts of Diamonds? How Are Diamond Cuts Made? How Do Diamond Cuts Affect Price? 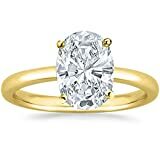 How Do I Know Which Diamond Cut to Buy? 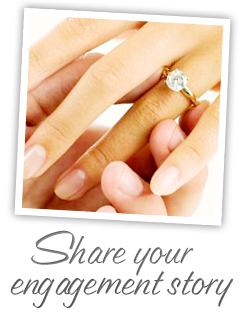 Part of the reason why choosing a diamond ring is so difficult, is that the choices are virtually endless. Diamonds can vary by shape, size, color, or cut. In spite of these variations, all diamond rings have in common the hardness that makes diamonds a perfect representative of an enduring marriage, engagement, or other long-term commitment. Though there are some significant differences between cuts, what the best cuts have in common are often their ability to highlight the remarkable qualities of diamonds. 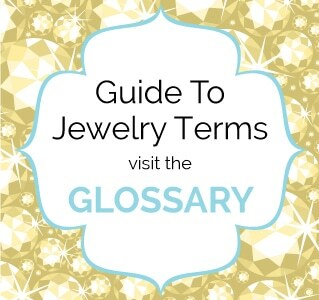 Here we will answer some of your most frequently asked questions about diamonds. Not all diamond rings are created equal. From size in carats, to shape, and color, diamond rings can vary in significant ways, and this can cause rings to vary in value and price range. Cuts of diamonds are a way that the jeweler can cut the rough diamond to emphasize the size and translucency of the diamond while also accentuating the light reflection properties of the stone. A cut also appeals to the personal taste of the future wearer of the ring. The jeweler uses diamond cutting machinery to cut the diamond in an extremely precise fashion, creating a specific overall shape of the diamond as well as facets that emphasize the various attractive qualities of the stone. 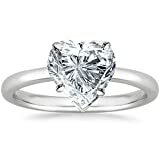 Over time, many new types of cuts have become available, some of which are well-known like the marquise cut, princess cut, heart cut, and cushion cut. Many factors affect price, the most important of which is the number of carats in the diamond. Other factors can also affect price, like color and also cut. Depending on the complexity of the cut, it can take time to shape and perfectly cut the diamond to reflect the brilliance of the diamond best or meet the specifications of the purchaser of the diamond. For this reason, more complicated cuts can frequently be more expensive than a round or oval shape cut. The thing about diamonds is that a jeweler can cut them in various ways to meet the taste of the buyer or to reflect their personality. The best cuts of diamonds reviewed here are those which many people believe best show the brilliance of the diamond or are otherwise unique. But at the end of the day, it is up to you to choose which diamond cut best reflects who you are and the image you want to project with the diamond ring. As mentioned previously, several factors affect price, namely carats of the diamond. 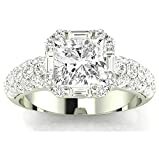 A relatively straightforward cushion, round or princess cut can cost about $2000, or it can cost $10,000 or more, depending on the number of carats, the band, or whether there are other diamonds or stones on the ring. We summarized the differences between 10 best cuts of diamond rings in terms of shape, complexity, and popularity. We highlighted the aspects of the cut that made it different from other cuts, or represented an innovation, as many cuts are relatively recent and represent advancements in diamond cutting technology. The price range for best cuts of diamond rings is highly variable and influenced by several factors including the number of carats of the stone, the jeweler, total number of carats, type of band, just to name a few variables. The cuts we reviewed here ranged from about $1500 to $40,000. Round cut diamond rings are the most popular cut, representing anywhere from 50% to 75% of all diamonds sold. Round cut diamonds are also among the most expensive because much of the rough stone is cut away to create this cut. For this reason, round cut stones are generally more expensive than stones in the fancy cut category. The round cut is not only a timeless shape, but it also emphasizes the brilliance of the diamond perhaps more than any other cut. 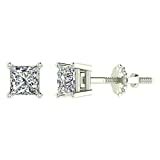 14K GOLD EARRINGS :Shine with Princess Diamond stud earrings.Exotic in shading and subtle in style,these diamond studs are a trendy way to be carefree and bold.These stylish pieces of jewelry adorn your ears and shimmer as you move.Sturdy stud earrings are everyday wear attire and also when the correct Fire and Brilliance can outshine everyone else at an occasion like a Birthday or even a Dinner party.Stud Earrings are the most popular and the Favorite jewelry piece that people shop for online. GLITZ DESIGN DIAMONDS : All our diamonds are legitimately sourced under the Kimberley Process Certification. These diamonds are graded as per GIA/IGI Diamond Grading Standards. Each gem selected under this system is required to meet rigorous standards of cut, clarity, color, and carat and is of guaranteed quality. As such, they are among the finest that money can buy. Glitz Design is located in Houston, Texas and is a jewelry maker which sets the highest standards of ethics and craftsmanship. 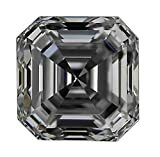 PRINCESS CUT: While displaying a great degree of brilliance, its faceting style is unique and completely different from that of a round brilliant. The Princess cut had its origins in the early "French" cut, having a step-modified "Double-French" or "Cross" cut crown and a series of unique, chevron-shaped facets in the pavilion which combine to give a distinct cross-shaped reflection when the stone is viewed directly through the table. The Barion shaped cut has now been renamed the "Princess cut"
EXQUISITE GIFT PACKING : Glitz Design provides an exquisite gift box that gives your gift a beautiful look. Your diamond jewelry would include the Certificate of Authenticity that verifies the 4C's of the diamond and gold purity. Your gift would be in an elegant gift box wrapped in a velvet pouch. A microfibre cleaning cloth would also be included in a pouch. Expect the best packing with this high-quality piece. Perhaps the most traditional of the best cuts of diamonds in the list, the cushion diamond cut has been around for two centuries and, until recently, was considered the standard in diamond rings. It is a square cut with rounded edges and has an antique look that many buyers like. 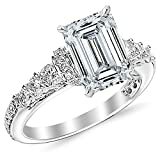 Although the cushion cut it regarded as having less brilliance than the diamond cut, it has more fire. The cushion cut is experiencing a resurgence and giving the round cut diamond a run for its money. Oval cut diamonds offer a meeting ground between the traditional round cut and the more recent fancy cut diamonds. 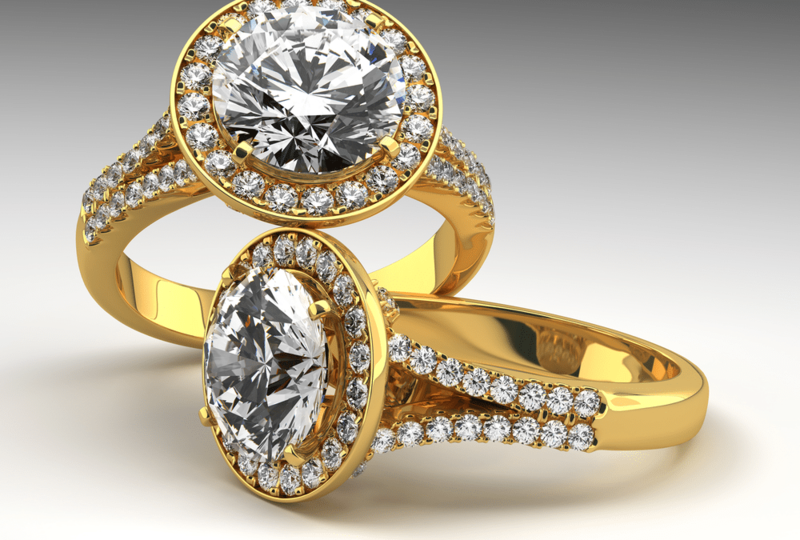 The oval diamond cut is a modified brilliant cut, and it compares well to the industry standard round cut. 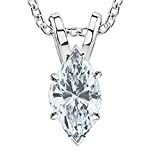 They possess similar fire and brilliance compared to round cut diamonds and may give the illusion of greater size due to their shape, much like the princess cut diamond. Oval cut diamonds may be a good choice for someone to add just a drop of flare to a traditional diamond cut. The marquise cut is interesting not only because of its name. This cut also called a navette cut, featuring pointed edges, and an elongated shape. This fancy diamond cut has a unique flair that too many people give the impression of royalty. It does have a shape suggestive of an oval, but its edges have led some to describe it as being more of a football shape. Emerald cut diamonds are perhaps more similar to round cut and cushion cut diamonds than the other cuts on this best cuts list. This is a timeless cut that features an elongated cut, cropped corners, and an open table. This type of cut was a long popular standard in emeralds, hence the name, and gives the diamond an artistic vibe that hearkens back to the first decades of the 20th century. Although the Asscher cut appears round, it is actually an octagon, and the original version features 58 step facets. It has a particular brilliance and elegance that has rendered it just as popular today as it was when it was first invented 100 years ago. A radiant cut is similar to the emerald cut, but with added brilliance. 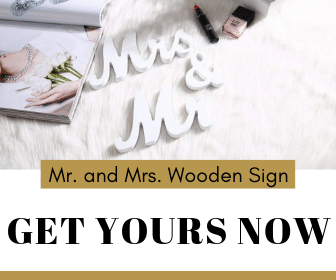 It has both a unique and timeless feel that makes it popular among brides everywhere. A truly unique design that renders this cut impossible not to place on the best cuts list. Although choosing which of the best cuts is the right selection for you will always be a personal choice, when it comes to a traditional and elegant look with unmatched fire, you cannot go wrong with the cushion cut. It has the wow factor of a round or emerald cut, but with just a little softness that can be enhanced by smaller stones set around the centerpiece diamond.